It’s snowing today – a lot. The first real snowstorm of the season and my little seedlings are stretching towards the muted daylight coming through the window…on a day like today it’s hard to imagine working in my garden, though I know it will come – eventually…Overnight these little seedlings thrive by the wood stove (I keep them on the stone hearth – warms them from the bottom and side) and by day they reach for the sun on a nearby window sill. I’ve started Black Krim tomatoes; an heirloom variety – beautiful dark purple-black fruit, old-fashioned flavor. A farmer friend recommended them to me – she grew thousands last year on the organic farm she manages, Carrot Top Farm. 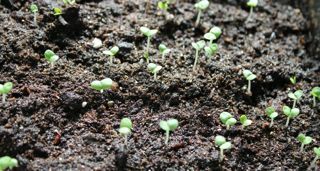 Below is a close-up of the basil I started last week – a basic Italian variety. Basil and tomatoes are the beginnings of my garden this year…despite the storm outside. This entry was posted in gardening and tagged basil, gardening, tomatoes, winter by ripe red berries. Bookmark the permalink. I can relate to what you wrote. We had snow yesterday, ground is completely white, pretty, i must admit. Cloudy today. My seedlings are also reaching for sunlight on my windowsills.